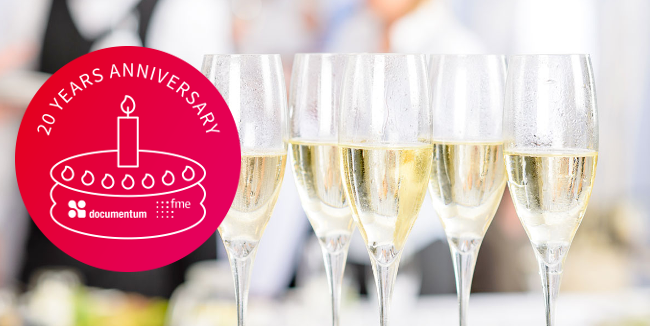 20 Years Partnership Anniversary Documentum and fme – And still going strong! From 1997 to 2007 I was employed at Documentum in Munich and was responsible for the technical sales issues for Central & Eastern Europe, Middle East and South Africa. 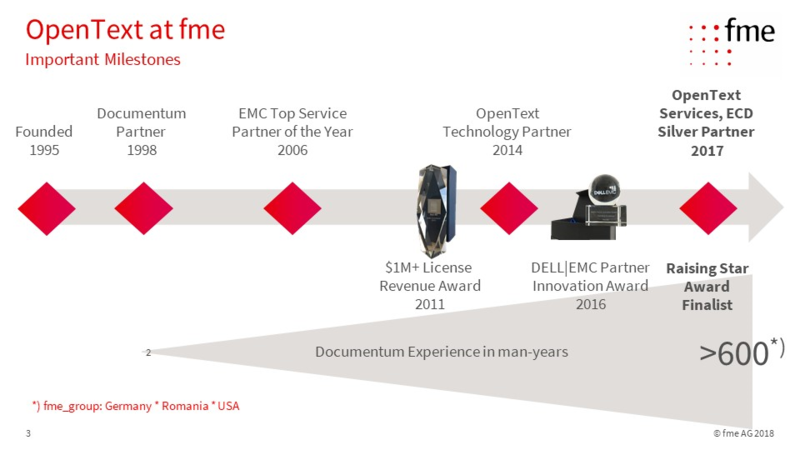 I witnessed the birth of the fme – Documentum partnership in 1998 at close quarters. 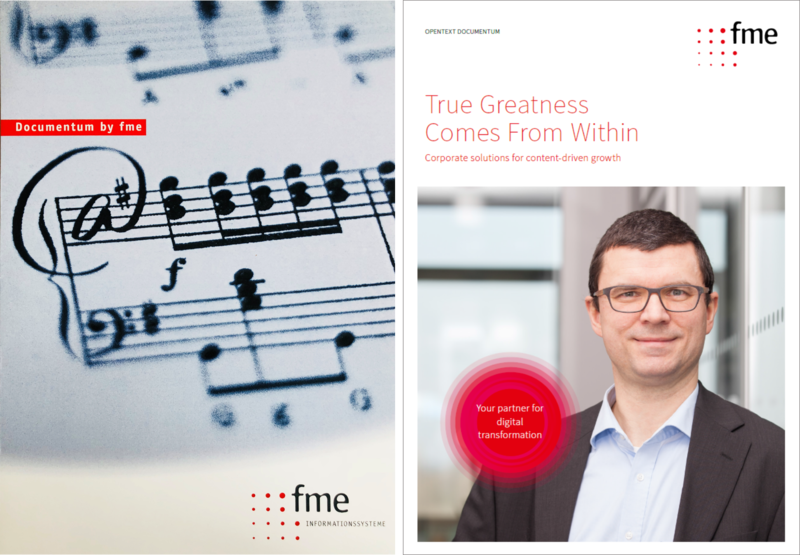 With fme Documentum had found the ideal partner to realize projects in Germany. Since then I have always followed the development and international growth of fme. That’s why I’m all the more pleased I joined the fme in 2015 and am now responsible for content management and cloud business as a board member of fme AG. At fme we are proud that this year marks the 20th anniversary of our partnership with Documentum, now part of OpenText. It is a success story with countless successful client projects, a world renowned product that has been certified for more than 10 years, extensive platform and industry-specific process know-how and a great team of highly specialized employees. When we started our first Documentum project in 1998 together with an automotive client, Enterprise Content Management was just one flourishing plant in fme’s portfolio at that time. Today, 20 years later, this area of our portfolio builds a solid cornerstone of our corporate strategy and is one of the reasons why the small team of around 15 employees at that time has grown into an international group of companies with more than 230 employees and locations in Germany, Romania and the USA. Our clients trust in Documentum: We still work with the client from back then and the installation we support has grown to be one of the largest with more than 70 thousand users and is the client’s only platform approved for confidential and secret documents. Of course we have gained many more since then, some of which we are supporting in projects around the globe with the help of fme SRL (founded in 2005) and fme US, LLC founded in 2010. Our expertise in long-term archiving has grown since then and one of our most reused solutions is the historical company archive based on Documentum which we have set up for large corporations like Volkswagen, Telekom, and the Deutsche Post DHL. More and more clients also trust in our Documentum Application Management Services (AMS) and work together with our skilled Team in Cluj, Romania. 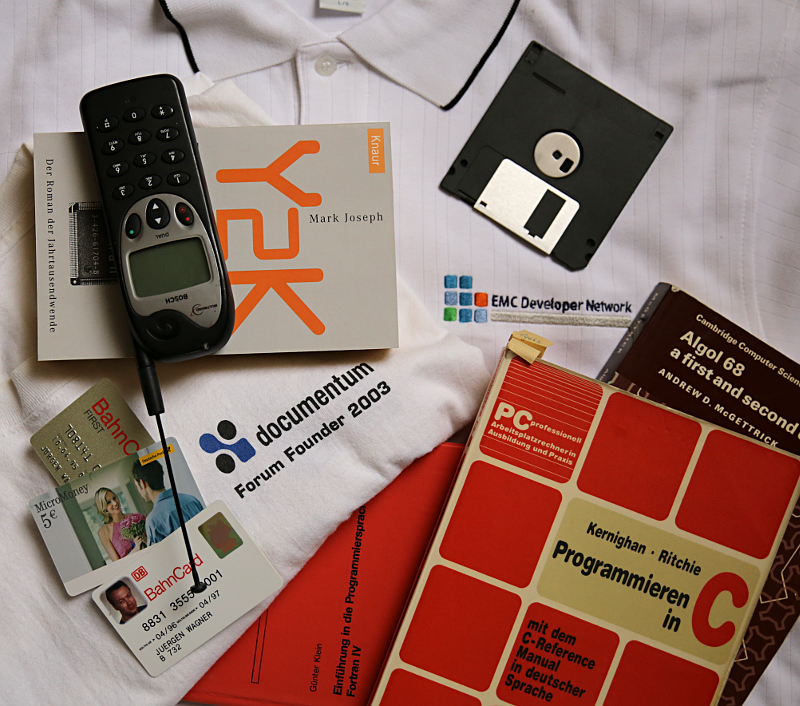 In the past 20 years Documentum was subject to some mergers and acquisitions but the community is still alive. OpenText acquired the Enterprise Content Division of EMC in 2016. Many clients initially seemed to be uneasy about the future of Documentum but we were and are sure that OpenText Documentum is here to stay. Please see Dirk Bode’s blog post “Keep calm and love Documentum (at least quite a bit longer)” and the interview from OpenText Enterprise World 2017: OpenText Live Presents Dirk Bode, fme AG on consulting – YouTube if you are interested to learn why. The messages from OpenText during the last two years are clear: they are commited to further developing Documentum as it has proven to be a reliable and scalable platform that continuously adapts to increasing number of requirements and the clients have resumed their projects. We are excited to learn more about the latest news at OpenText Enterprise World in Toronto in July. We are happy that continously training our experts on the latest trends and requirements of our clients has proven to be the right decision. Over time we have added industry-specific process expertise which means our industry experts are both Documentum experts AND for instance Certified Regulatory Document Management Compliance Professionals. To fulfill the high demand for certified Documentum experts we are also regularly hiring additional team members. Should you be expanding or reorganizing the strategy for your OpenText Documentum platform majorly please talk to us so we can align our services and resorces even better to your requirements. Last year we set up a showcase with OpenText Documentum and Amazon Alexa to demonstrate how Documentum can be managed via voice control. Such innovative solutions are of course based on our team’s deep core knowledge with Documentum. Fun fact: did you know that we are using Documentum internally at fme group? One of the most useful customizations we did is the document number – our corporate presentation is probably the best known document number: everybody knows the #6120 😉 Combined with the extended search you can find documents very fast and easily using #… when searching for numbers, *… for document names, and +… for folder names. Our commitment to the Documentum platform is obvious: numerous client projects, annual exhibition appearances at all OpenText events, a longterm membership in the Documentum Partner Advisory Board and many marketing campaigns prove this. With the organization of the OpenText Documentum User Group in Germany and in the United State we help our clients connect and benefit from the OpenText Documentum community. Last but not least many awards over the last years demonstrate our commitment. This year we have been nominated as one of three candidates for the OpenText PARTNER of the Year Award in FY 2018. The winner will be announced during the Enterprise World Partner Session on July 9th. Keep your fingers crossed for us! We believe in Documentum and look forward to continuing this story with you, as our clients and partners and of course with you, our employees! Cheers to the next successful 20 years with OpenText Documentum!